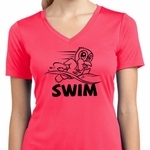 A ladies flowy v-neck tanktop featuring a penguin power swim design. 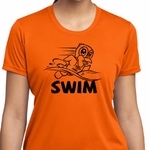 Our ladies tank top makes a perfect gift for swimmers who love penguins. 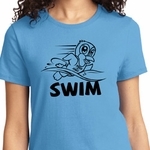 Solid colors are made of poly/rayon; Marble colors are made of poly/cotton. Available in sizes Small through 2XL. Machine wash cold with like colors; dry low heat.